It is easy to love the imagery world of Ola Niklassons So many fun details, unexpected and familiar at the same time. I recognize the backgrounds from vintage art usually found in flea markets – not very impressive painting techniques, amateur style. But then I spot two H.R. Giger’s aliens having a picnic. 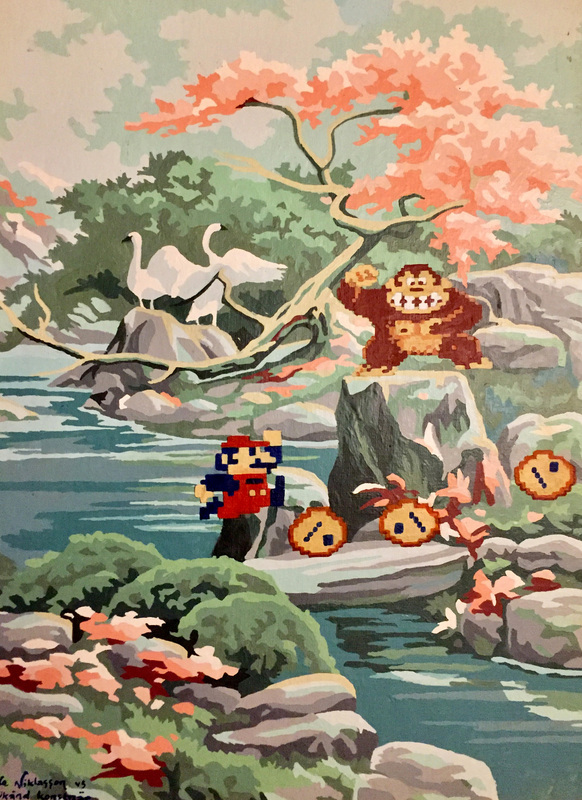 And there’s Super Mario Bros crossing a river, accompanied by two swans and a territorial Donkey Kong. I am instantly amused. Your work brings much joy – but also contains some dark elements. What is the usual reaction from your audience? When I have a show and observe visitors who do not know me before, their first reaction is usually confusion. 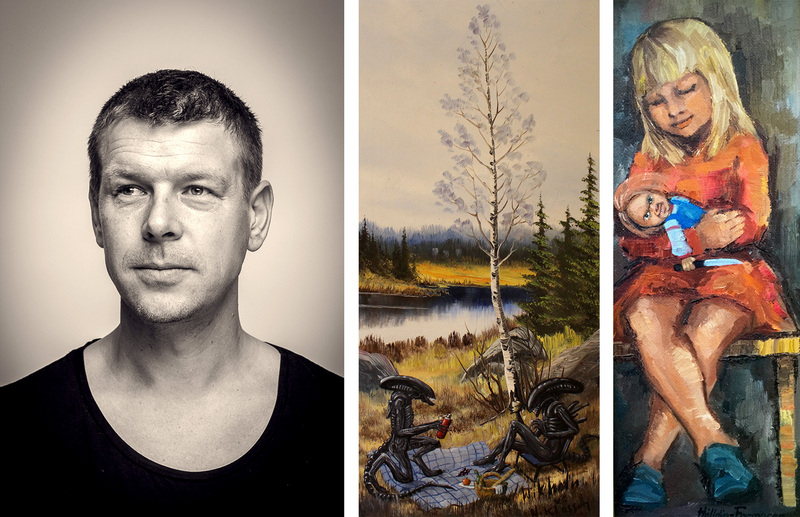 They enter a gallery filled with the kind of paintings that you see at flea markets or at your grandparent’s home … … but it is somewhat twisted. Something that is quite off. It is very fun to see how the confusion slowly changes to giggling and laughing when they see the redesigned parts and start reading the titles. The pieces must speak for themselves, but for me it is important that the titles reinforce, twist or contribute with a whole new dimension. Just as you say, I like to mix happy, cozy motifs with others where the laughter suddenly stops. I have had many visitors who first laughed, then said that “this one is scary, am I really allowed to laugh at this?” And then laughed again. When I started with this concept I imagined that it would be only people of my age (born in the 70s) or younger who would appreciate the paintings. It turned out to be completely wrong. All people may not understand all the references, but there are many older people who really really like what I do. It is surprising but fun of course! Your art feels like street art but for the home and you re-work vintage artworks that you find at flea markets. Tell us about your creative process. It differs. Sometimes I get an idea of ​​what I want to do and I look around for a suitable flea market bargain that fits the motif. I have many ideas that are just waiting for the right picture to appear. The most common thing is that I buy a painting that I think nobody really wants. If it is a reproduction, it does not matter, but I am not looking to “destroy” original boards that others would like to hang on the wall the way they already are. Then I set it up on my wall, that is full of paintings which I have not yet started worked on. This takes place during the “thinking process”. I’m observing and absorbing. Sometimes an idea comes quickly and sometimes the original paintings can hang there for a long time. Finally, I will come up with an idea. There is still no painting that I have given up on (although it has been close many times). The next phase contains sketching and painting. Usually I want to customize the colors and style so that what I do blends into the original image. It is very much about capturing color tones from the rest of the picture in my add-ons and aftermathing the style of the painting. Sometimes I reinforce or add colors to the original background for it to fit together. The last phase is naming the piece. I almost always have a basic idea about the title right from the start, but it usually needs to be refined a bit. Sometimes I have several different options and then it is simply about making a decision. What emotion or thoughts drives you in your creative process? I want things to clash. Like a calm seascape combined with a giant rubber duck. A still life with flowers, decorated with furious Star Wars characters who are unhappy with the new Death Star appearance. An old Dutch portrait where the woman, despite having a nasty face-grabber on her face, sees it from the bright side and is thinking that she doesn’t have to put her make up on anymore. I think that’s fun! I am inspired by art that dares to stand out a bit and that does not take itself too seriously. A good idea I think can be at least as important as the actual creation itself. I am a big fan of the Swedish artist Jan Stenmark, who creates collages with both text and images which results in absurd humor, It is difficult to mention everything that inspires me. It can be everything from Marcel Duchamp, dadaism, surrealism, pop art and street art to Monty Python and a white killer rabbit. In other words – it’s quite a mix. I grew up with the comic book Larson and in a way I still think it is included as a source of inspiration. I loved its humorous one-frame cartoons – and they are reminiscent of what I am actually doing now-days myself, but in the form of paintings. 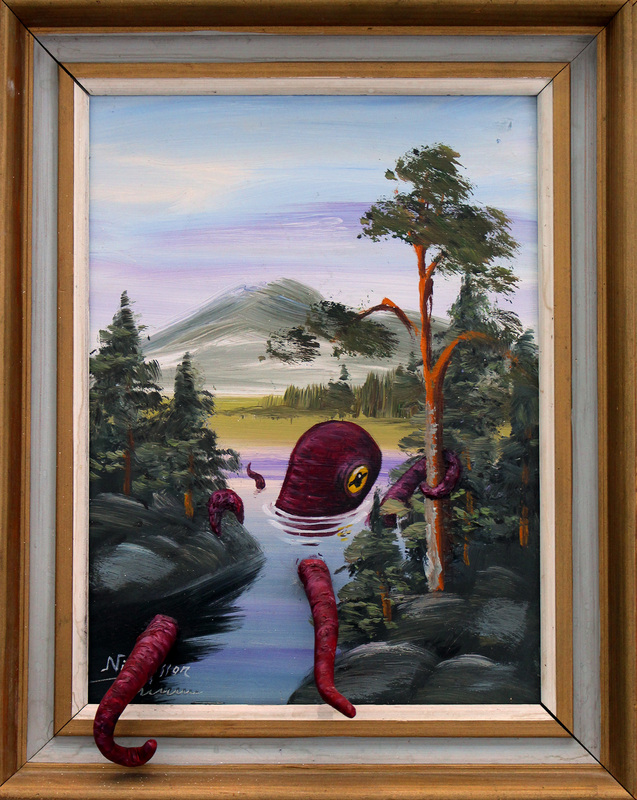 I combine fine culture with junk culture, cartoons with oil painting, old kitsch with new kitsch. There are a lot of references to pop culture in your images, like Star Wars, Mario Bros, monsters etc, what is your relationship to nostalgia? Nostalgia is an important ingredient in my paintings. In a way, most of the paintings are a reflection of my youth. I think about my cartoon collection I had as kid, my favorite movies, (which often contained monsters), my friend’s Nintendo 64, the humor of Monty Python and The Black Adder and the monster spiders and neon snakes which decorated the walls of my old room. 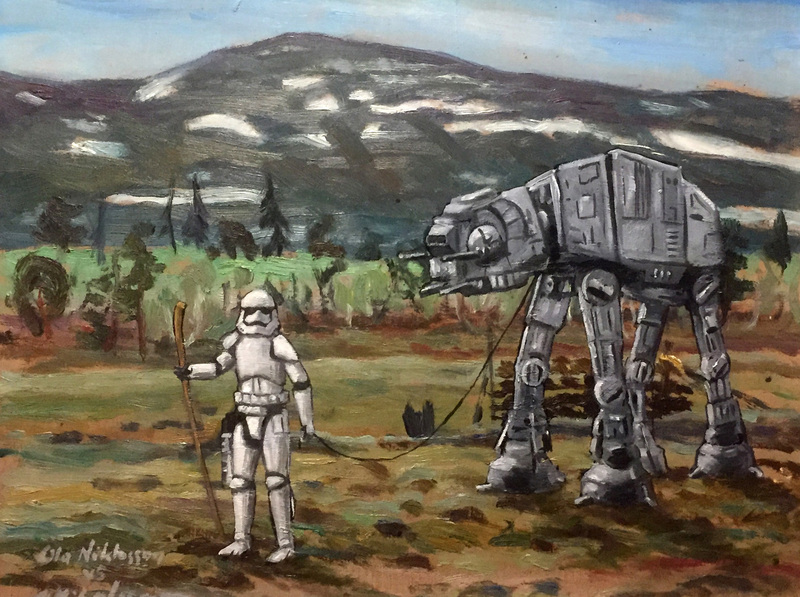 Because I use nostalgic popular cultural elements combined with vintage amateur paintings found at flea markets (which used to be found in a typical Swedish home), the cultural clashes become more interesting. If I paint Batman the way he looked like in the 70’s, the effect will be different from how he is presented today in pictures and movies. But he is still recognizable. It adds another dimension and the paintings can even speak to a younger audience who only knows the current popular culture references. It becomes like a Kinder Surprise where the different parts can have different importance and also possible to understand for different generations. Do you like the toy, the chocolate or do you just like to be surprised? Which famous original artwork would you like to add something to? I love art and I love art history. I would not want to destroy any famous original artwork by painting on it…. BUT… if I am allowed to think purely hypothetically, it would be great fun to go nuts on the entire Sistine Chapel ceiling, painted by Michelangelo. It could be a crazy fun result of transforming the old religious characters into Star Wars characters, superheroes or monsters. Awesome!